This photo accurately reflects my feelings about this plate of food. Last night I met up with some old friends for a glass of wine, a bite to eat and a natter about the comings and goings of 2011. We decided that the Santorini's new restaurant on the main street might be a good place to try. I'd been to the Santorini behind the Hamilton hotel a couple of years ago and not had a wonderful experience, but I was willing to give them another go, especially in their new location. Unfortunately... more of the same. I ordered the mixed grill for 25,000 won: A chicken kebab, some lamb gyros, a "meatball" which looked and tasted suspiciously like a burger, fried potatoes and pitta bread. The meats weren't bad, perhaps a little too salty, the fried potatoes were passable, but the pitta bread was so tough that I feared for my teeth. "Tried it last weekend. Wasn't massively impressed, certainly at those prices. Hope it's better for you!" I had kept my hopes up for Santorini, but I fear I won't be darkening their door again. Perhaps not a Greek tragedy, but certainly a disappointment. That's disappointing. Yesterday I went to a ramen restaurant, and I'm not sure if it's because I tried better ramen since I went there, or because they lost their old chef (or whatever)... but after jonesing for ramen all morning, I can't remember being more badly let down from high expectations. That's always a horrible feeling. Sometimes our favourite restaurants just don't survive the test of time. Bombomb in Itaewon is similar - used to be cheap, delicious and just plain magical; now it's overpriced, underwhelming and just plain dull. 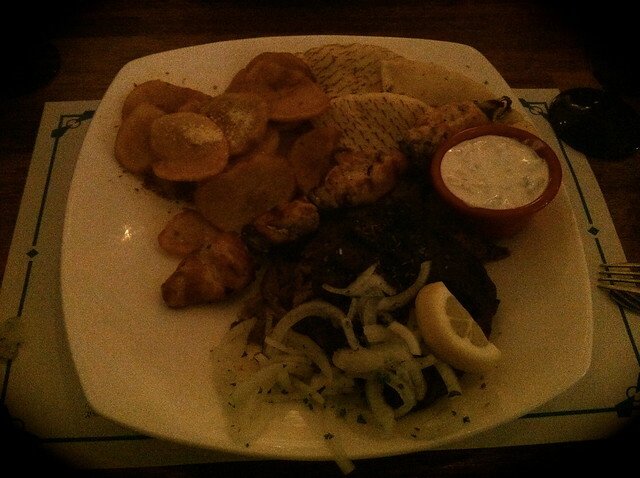 Last time I went to santorini behind Hamilton Hotel I left feeling ill from the obscene amount of oil in the food. Just got Greek food here in Boston this week and was pleasantly surprised that it was not very greasy at all! And sadly, the portion size here in America was more reasonable than the enormous amount of food I was given there, which I couldn't bring home because I was going out after... and that price at the end is the final kick in the rear to top it all off. it must have been the night for it.. I went to one of my favorite chicken places, got home, and found out the guy skimped me on the chicken breasts. Usually you get 2 very good sized chicken breasts, done up well in a garlic coating..got home and opened it up to find 2 breasts that would have looked poor on a chick. It's almost like the meat had been stripped off them, just a long hung of bone, and then a tiny bulb of meat at the end.